Being the Home Minister of India is not just a security but also a political minefield. This home truth must have been evident to Mr P Chidambaram, India’s peripatetic Home Minister whose performance was under intense scrutiny by his opponents in the Congress party after 76 hapless policemen were brutally slayed by the Naxals on 5 April in Chhattisgarh. While Mr Chidambaram’s predecessor, Mr Shivraj Patil had to go in the wake of the Mumbai 26/11 terror strike, will PC as the Home Minister is popularly called be tripped by the Naxals is increasingly engaging the New Delhi grape vine. 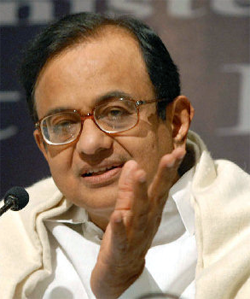 To his credit Mr Chidambaram very promptly tendered his resignation taking the blame after the bitter controversy he had raised over the Chief Minister’s being wholly responsible for security in the states. More over he is seen to be a rather changed man, no longer the ebullient and confident self that he posed to the media for the past few days possibly chastened by the experience and recognizing the massive challenge that internal security in India is. More over a Minister in a democracy like India with a large mass of population below the poverty line, 37 percent or over 400 million by the official line cannot be seen as arrogant, what ever be his capabilities. Mr Chidambaram is not Mr Shashi Tharoor and being a perceptive man that he is possibly would do well to shift gears towards a people centric strategy in countering Naxalism. Going beyond the personality it should be evident for any perceptive observer however that the Naxal challenge is not likely to go away in a hurry and Mr P Chidambaram may be the best bet for the country, for possibly apart from Mr Pranab Mukherjee the Congress does not have a person who can competently fill the shoes of the Home Minister. What may however be necessary for Mr P Chidambaram is to review the counter Naxal strategy as has been indicated by the Congress party, Mr Digvijay Singh and Mr Mani Shankar Aiyar from that of exclusive reliance on Green Hunt to broader engagement of the people, particularly the tribal. This and the universal need for enhancing security capacity are sine qua nan for any Home Minister of India. Thus the two arms of this strategy are better capacity building of the Central Police forces and the para military bringing them at par with the army and establishing linkages with the tribal. After many rights activists have called for succour to the tribal and not necessarily the Maoists the government has to review the policy in the days ahead. It would be well advised to go soft on the so called Green Hunt, build up strength and the capacity of the police forces and also ensure that the tribal are brought into the overall grid of counter Naxal policy not just development based on infra structure but political engagement. While this is the model that generally works, it is seen that by adopting for a police only approach the Home Minister had forsaken the counsel of people who had adequate experience. Hopefully now there would be a change of strategy and the Report by Mr E Ram Mohan who is universally acknowledged as a forthright and plain speaking officer with vast experience should show the way ahead. For the present given the parliament session there is consternation in political circles over how to tackle the Naxal menace. While the Home Minister supported by the opposition the BJP are for a hard line approach and so far the majority of the Congress party supports its Home Minister, there are voices within the party with Mr Digvijay Singh one of the prominent leaders and a former Chief Minister of the state of Madhya Pradesh which had Chhattisgarh as one of its components seeking a reach out to the tribal as a part of the solution. As the old warhorse Dhirubhai Ambani used to say when in trouble listen to your enemies they would tell you the way ahead. While Mr Digvijay Singh is by no means Mr Chidambaram’s enemy but the wise counsel he has given has some merit. Others as the Railway Minister Mamta Banerjee’s Trinamool Congress are openly opposed to any police action. Thus the debate of talks versus guns is likely to continue in the days ahead and the Maoists would be more than happy to see the government in a dilemma. What ever be the outcome of the current debate, it is important for the Home Minister to open his options. A multi pronged strategy with the people as the centre of gravity is the key to any counter militancy campaign. Mr P Chidambaram would do well to go back to this basic and the Naxals will naturally lose support of the sea of people in which they are surviving today. It is also important us to ensure that it is the Naxals and not Mr Chidambaram who trips in the days, months and years ahead. So support with criticism will be the way ahead.